The Amed (Diyarbakir) Conference for Democracy and Peace, one of four being held across Kurdistan and the diaspora, took place 15-16 June 2013. The conferences are being organised as part of the ongoing peace process. 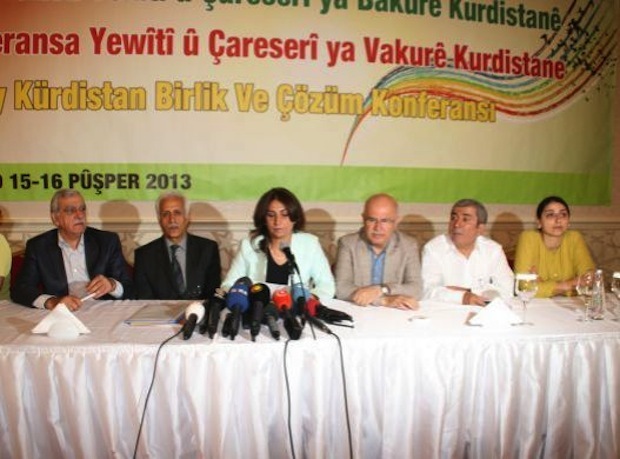 Our Conference, in which representatives of various political, ethnic and religious groups participated in Amed [Diyarbakir] city on 15-16 June 2013, has taken historically significant decisions, and concluded successfully. We, representing all the different hues of Kurdistan, are sharing the conclusions and decisions reached after intense debate and discussion. The Republic of Turkey has inflicted on its citizens the most severe oppression and exploitation as a result of its official founding ideology and unitary nation-state approach. It has not only coerced the Kurdish people and all the communities of Kurdistan to assimilate into a single Turkish identity, but also inflicted the same policies on Anatolian communities. Various Christian minorities, such as the Armenians and Syriacs, ethnic groups like the Arabs, Laz and Georgians and Moslem minorities like the Alevis have all suffered as a result of state oppression. The Conference remembers with respect all those who have fallen in the last century, which has witnessed a continuing struggle for Kurdish freedom. As a part and continuation of this tradition of uprisings, the last Kurdish insurgency lead by the PKK (Kurdistan Workers Party) has continued for more than 30 years. State intimidation and repression has not proved able to break the resistance of the Kurdish people. Our Conference, based on a longing for peace and liberty, has taken a significant step and reached historic decisions for the free future of Kurdistan and the entire region. 1- Mr. Öcalan has created a historic opportunity for the democratic and peaceful solution of the Kurdish Question. The Kurdish Movement has taken concrete and sincere steps for a solution. Our conference calls on the government to also take steps displaying the same sincerity and seriousness. Our delegation is concerned over the language the government is still using and the attitude it is displaying, the construction of new military posts in the Kurdish region and the increase in the employment of village guards. It calls for the ending of these practices which lead to the loss of public trust and questioning of the government’s sincerity towards the process. In this respect, our conference demands freedom for Mr. Abdullah Öcalan, the main actor inthe democratic solution process, in order to ensure healthy progress towards a solution. 2- Our conference decided that no lasting solution could be achieved to the Kurdish question unless Kurdistan gains a status. It was agreed as a common principal that the peoples of Kurdistan have the right to national self-determination (such as autonomy-federation-independence) on the basis of only their own decisions and approval. 3- Our delegation demands the formation of a contemporary and democratic constitution. The peoples of Kurdistan’s rights of organization with their own identities, mother tongue education and recognition of Kurdish as an official language must be guaranteed constitutionally. 4- Kurdistan has experienced great social problems such as poverty, migration, unemployment and ecological disasters. Our conference emphasises the importance the transfer of public funds to Kurdistan on the basis of positive discrimination and the establishment of a mechanism that shall include politics, NGOs, local administrations, and other different groups. Our conference expresses its sincere trust in the youth for the establishment of Kurdistan’s future and attaches importance to their opinions. 5- Legal reforms are required to enable the release of all political prisoners in jails, in particular children and prisoners with health problems. The State must fulfil its responsibilities to shed light on the issues of unsolved murders and mass graves. 6- Considering its evaluation of the gender paradox as one of the fundamental questions of the 21st century, our Conference points out that the situation of women, the most dynamic and the founding actor of the community, cannot be dealt with separately from the society. Any kind of intervention and attack against women is an intervention and attack on the society. Our conference declares that it is against all kinds of attacks targeting women. The Kurdish women’s role in the struggle in Kurdistan serves as a model for the entire world. Our conference embraces women’s determination, as an autonomous and original community, for equal participation in all stages of social life on the basis of gender equality. 7- Both the policies of the State and the false consciousness these policies have created significant problems for all minorities in Kurdistan We believe in the necessity of building a new and equal life on the basis of facing up to this tragic history. Therefore, our conference will make great efforts to provide the conditions needed to enable minority groups to lead a free life based on their beliefs and cultures. The Northern Kurdistan Solution and Unity and Solution Conference calls for the return of all groups who were forced to leave their homeland in the 20th century. 8- Our Conference announces its support for the popular revolution in the Rojava (Western part of Kurdistan, under the sovereignty of Syria). considers it important that Rojava ensures its unity under the umbrella of Kurdish High Council. It indicates that each person in Kurdistan should protect the achievements accomplished in Rojava. It condemns all attacks by the dictatorial regime and certain gangs affiliated to the Syrian opposition against Rojava. Our conference calls on Rojava to keep its borders open and for the people of Kurdistan to send aid. It demands that the international community officially recognize and include Rojava Kurdistan in the relevant mechanisms for a solution to the Syria crisis. 9- Our conference attaches vital importance to the gathering of the Kurdistan National Conference and announces that it will fulfil its obligations in this respect. It calls on Iraqi President Jalal Talabani, Kurdistan Federal Region (KRG) President Massoud Barzani, the KCK (Kurdistan Communities Union) Presidency Council and all other powers in Kurdistan to take steps for the gathering of the National Conference as soon as possible. 10- The Conference Delegation expresses respect and gratitude to all individuals and structures that have contributed to the cause of Kurdistan. 11- Our Conference calls on the United Nations (UN), the European Union (EU), the Organization of the Islamic Conference (OIC) and the peoples of the world to act responsibly towards the struggle of the people of Kurdistan for freedom and justice. Our Conference urges all international organizations and states to remove the PKK (Kurdistan Workers’ Party) from the list of terrorist organisations. 12- The Conference Delegation decided on the establishment of a “Unity and Solution Committee” to represent the will of the Northern Kurdistan Unity and Solution Conference. Being open to broader participation the Committee is authorized to monitor all the decisions the Conference took, to establish commissions in the relevant spheres, and to recall the Conference Delegation at a later date. This Committee performs its works on the basis of its mission as the effective organ of the democratic negotiation process. 13- Our Conference calls on the peoples of Turkey to recognize and accept the will of the Conference and to urge the Turkish state to recognize the rights of the Kurdish people. Our conference also supports the democratic and legitimate struggle of Turkey’s peoples. We hope that our Conference and unity will be auspicious for all the people of Kurdistan.